Are you ready for Vodafone’s new look? Vodafone has unveiled a new look, drawing on the belief that technology is set to radically shake up our lives in the future. 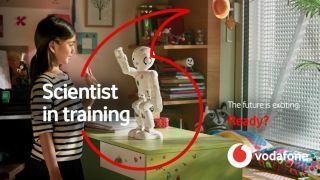 The new strategy, which will be employed in all 36 countries where Vodafone operates, draws on the assertion that new technologies and digital services are set to transform society and enhance individual quality of life in the coming years. There’s a radical change to how the strapline will be used, with a mix of local languages and English involved. The first part of the strapline will be presented in the country’s native language, with the second part – “Ready?” – written in English. For example, in Italy it will read: “Il futuro è straordinario. Ready?” And in Spain: “El futuro es apasionante. Ready?” There will be a change in visual identity too, with the familiar ‘speech mark’ logo being given a more prominent position in all marketing communication. The new strategy is being complemented by a fresh TV commercial that focuses on the consistency of human interaction, even as technologies change. The company found that people were optimistic about the ways in which technology will help them in the future. According to Vodafone research, carried out by YouGov, the campaign draws on positive beliefs about the future. Young people are especially optimistic: 62% of them think living standards will be better in 20 years’ time. Vodafone Group chief commercial operations and strategy officer, Serpil Timuray, said: “We believe there are very good reasons to be optimistic about the future as emerging innovations in science and technology begin to have a profoundly positive impact on society. Vodafone has a long and proud history of bringing new technologies to hundreds of millions of people worldwide, enhancing quality of life and transforming the workplace.